Love the content, but I purchased my Digital Subscription through iTunes. Now I am unable to view via web browser as well. Is there a way to link the subscriptions? The ABC is a wonderful publication. The problem is this app is honestly the most aggravating app I have ever used. It is a complete waste of money. I end up just buying the printed version which is inconvenient and costly considering I in theory already have a subscription. The customer service at ABC is equally horrible. They only want to sell subscriptions. Once they realize that you have a subscription they send you back to Apple. I hate it. ABC really helps me in my line of work. I opted for the digital delivery on my iPad to help keep up with the weekly editions. The issue may have been resolved as it hasn't happened for a month. You may find the app disassociates itself from your subscription thus requiring you to log in which doesn't work. You have to either remove and reinstall the app or refresh it which works fine. The weekly edition download is a major frustration requiring an app reset and login each week. The app (I have 4 different city digital subscriptions and they all require this) indicates I have an active subscription, but wants to charge for each issue unless you reset the app and login each week. All my other digital magazine subscriptions do not require this headache. Nice periodical but I'm about ready to cancel all 4 subscriptions. Pretty pathetic app. Very difficult to navigate and read articles. Ehhhh, gets the job done I guess. 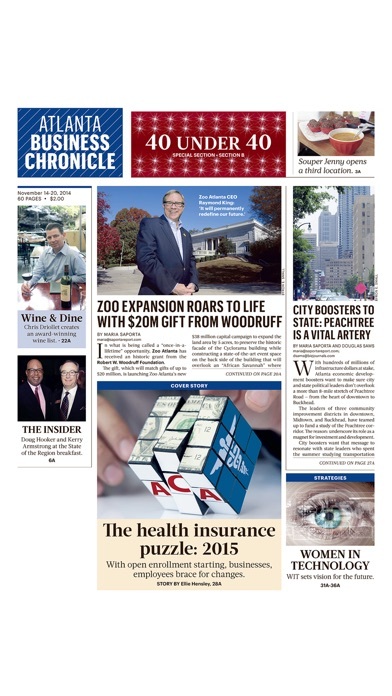 I love the Atlanta Business Chronicle and you can still get the great info from this bare-bones app, but it would be nice to see you guys add a feature for sharing articles on facebook, twitter and other social networks. Great start, but needs a dab or two of polish!